David A. Adler and Edward Miller, the creators of Mystery Math: A First Book of Algebra, have returned. This time the duo takes on dimensions using characters kids will love...monsters. 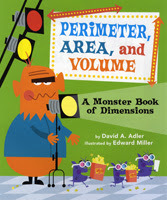 The setting is a monster movie, and the lovable and goofy monster characters from Monsters in the Neighborhood demonstrate length, width, and depth to young readers. Adler begins with basics and moves to the more complex concept of three-dimensional objects using movie screens, popcorn boxes and monster raincoats as examples. Adults will appreciate the reference to Singing in the Rain as monsters sporting raincoats and umbrellas line the sidewalk outside the theater. Children will be amused by the humorous illustrations especially the pages showing purple, pink and green monsters adorning 3-D glasses in a movie theater. Teachers may want to read aloud this nonfiction picture book to math classes as a way to introduce or reinforce the concepts of area, perimeter and volume. The book will also be a hit with children looking for an independent read. 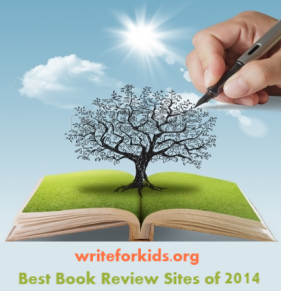 It has been a great year for us!